Perhaps owing to my mother’s lifelong love of horses, I have long adored draft horses and war horses. So, clearly, the princess needed a strong horse to ride in her adventures. Her story shall be full of rounceys, coursers and even a destrier. 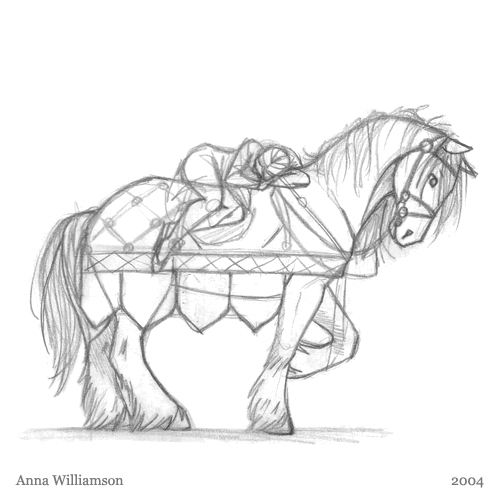 This sketch is clearly older but I still like the structure of the horse. For some reason the princess has curled up on the saddle to take a nap… perhaps that’s why she chose such a large mount. Wow! I love your art! This is one of my favorites! You were my inspiration to start sketching. My name is Jessica and I hope one day I am as good as you. Please keep sketching! I love your work! I even want to bye a sketch from you, a large one of the horse, to put on the wall above my bed. I love horses and if you are willing just tell me a price. In fact, I’m working on making prints and t-shirts available as soon as I can!